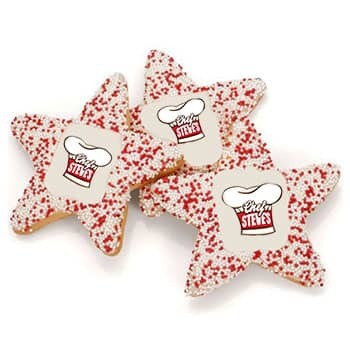 Star-shaped sugar cookies, iced and decorated with sprinkles. Print your custom design in full color directly on the cookie. Maximum imprint area = 1.5" x 1.5"
A star-shaped sugar cookie, baked from the finest ingredients and then hand-decorated with sprinkles. Your custom design is printed directly onto the icing. Color coordinate the sprinkles to your design for a truly unique finish. Unlike other online bakery businesses, we never use edible paper. The taste, texture and tendency to peel off the cookie make edible paper a bad choice for corporate gifts. We developed our own process where we can print directly onto your custom cookies. This keeps everything looking crisp and rich, and tasting great. If you need to send a large order, ship to multiple addresses or include marketing materials, our Gift Experts are happy to help. Just fill out a Request Estimate form to get in touch. The possibilities are endless, and our years of assisting corporate clients have given us the knowledge and insight to make even the most ambitious promotional gifting campaigns come to life.